If your business hinges on its data, then imagine what would happen if you were to lose it all—every client database, all your financial records—all of it. A disaster could also knock out your network for hours, days, or even weeks, leaving you unable to access email or any files stored remotely. A natural disaster could destroy your physical offices and everything within. A virus could leave your servers crippled. However, a quality emergency recovery plan will help to mitigate all these disasters and recover quickly in a reasonable amount of time. Not having one, though, may leave you unable to recover quickly—or at all. Without a quality recovery plan, you could easily lose everything you’ve built with your company overnight, and since manmade threats are becoming more and more pervasive, there’s a good likelihood that you’ll eventually be hit with a crippling disaster sooner rather than later. According to the National Archives and Records Administration, more than 90 percent of companies that experience at least seven days of data center downtime go out of business within a year. 68% of SMBs don’t have a disaster recovery plan (source: Nationwide Insurance). 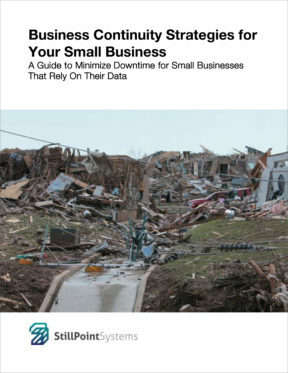 96% of businesses with a disaster plan in place fully recover operations. In other words, a plan could, and probably will, save your business. Much like insurance, a recovery plan can provide you with peace of mind. By having one in place, that’s just one less thing you’ll have to worry about and you’ll be able to focus on other priorities. While you may want to believe that only big corporations must deal with disasters, especially the manmade ones, this is sadly not the case. Even though big companies have enough of a cash buffer to manage any of the related costs, small businesses are much less likely to have the kind of spare cash lying around to fix these issues. This makes it more imperative for small businesses to be proactive and BE PREPARED. These issues can be expensive for small businesses; anywhere between $137 to $427 per minute (Source: Carbonite). Most of all, a recovery plan will simply reduce any downtime caused by these disasters and ensure that you retain access to your data when anything from human error to hardware failure hits your business. According to Dynamic Technologies, hardware failures cause 45% of total unplanned downtime. This is followed by the loss of power (35%), software failure (34%), data corruption (24%), external security breaches (23%), and accidental user error (20%). When we think of hardware failure, floods, fires, and earthquakes come to mind, but all it takes is one bad choice by one of your employees to put your data at risk. Computer systems themselves aren’t perfect. Even with a 99% uptime guarantee, there is always that 1%, and planning for that eventuality may save your business and allow you to recover faster during these situations.